A large majority of economists, 84.2%, said they saw a greater risk that the economy would grow more slowly than that it would grow more quickly over the next 12 months. When asked about the biggest downside risk to their forecasts, nearly half of respondents, 46.8%, mentioned trade policy or China. As seen in the “Recession Probability” section, the average response as to the odds of another recession starting within the next 12 months was 24.51%. The individual estimates, of those who responded, ranged from 1% to 60%. For reference, the average response in February’s survey was 24.53%. As stated in the article, the survey’s respondents were 66 academic, financial and business economists. Not every economist answered every question. The survey was conducted March 8 – March 12, 2019. 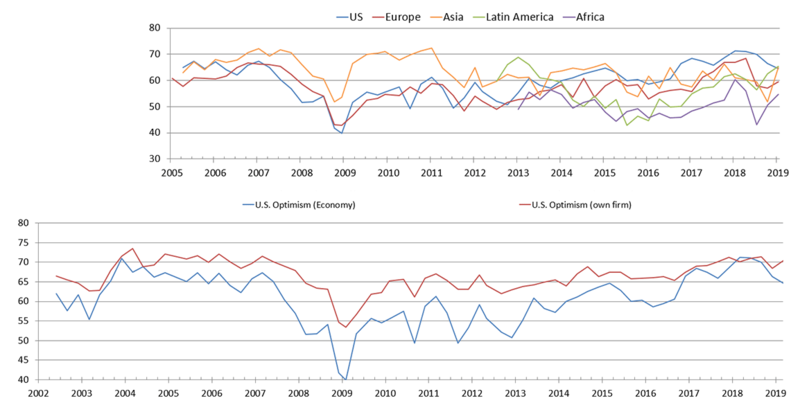 This entry was posted in Economic Forecasts and tagged Economic Forecasts on March 14, 2019 by Ted Kavadas. As seen in the “Recession Probability” section, the average response as to the odds of another recession starting within the next 12 months was 24.80%. The individual estimates, of those who responded, ranged from 0% to 60%. For reference, the average response in December’s survey was 22.02%. As stated in the article, the survey’s respondents were 73 academic, financial and business economists. Not every economist answered every question. The survey was conducted January 4 – January 8, 2019. This entry was posted in Economic Forecasts and tagged Economic Forecasts on January 10, 2019 by Ted Kavadas. Nearly half of economists who responded to a survey by The Wall Street Journal, 47.3%, said they viewed the U.S. dispute with Beijing as the No. 1 risk for 2019. Some 20% cited financial market disruptions and 12.7% pointed to a slowdown in business investment. Just 7.3% of economists, or four respondents in total, agreed that Fed rate increases were the biggest threat to the economy in 2019. A couple of private-sector economists cited other risks, such as excessive federal spending. Just over 9% pointed to slowing global growth as the biggest threat. As seen in the “Recession Probability” section, the average response as to the odds of another recession starting within the next 12 months was 22.02%. The individual estimates, of those who responded, ranged from 0% to 50%. For reference, the average response in November’s survey was 19.55%. As stated in the article, the survey’s respondents were 60 academic, financial and business economists. Not every economist answered every question. The survey was conducted December 7 – December 11, 2018. This entry was posted in Economic Forecasts and tagged Economic Forecasts on December 13, 2018 by Ted Kavadas.